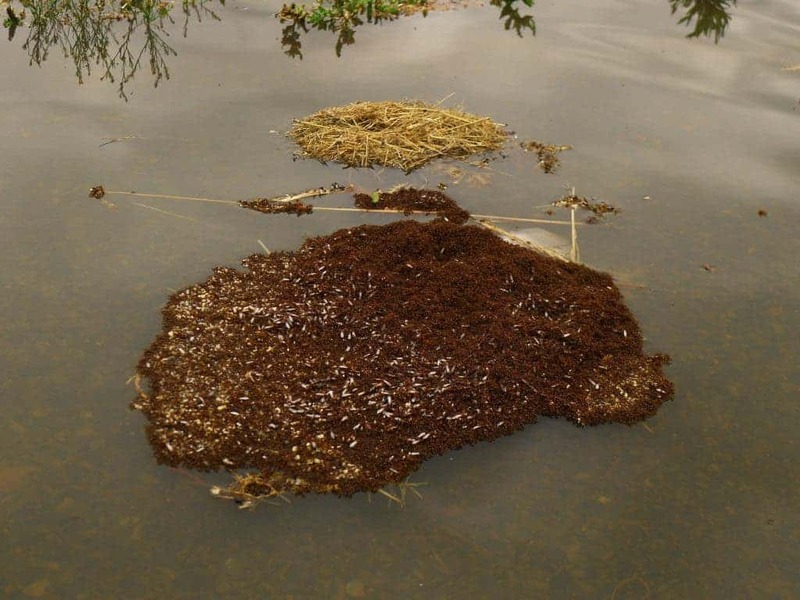 In what can only be described as an incredible natural engineering feat, fire ants in times of floods have the remarkable ability link up with one another to form a life-saving, floating and impenetrable raft. 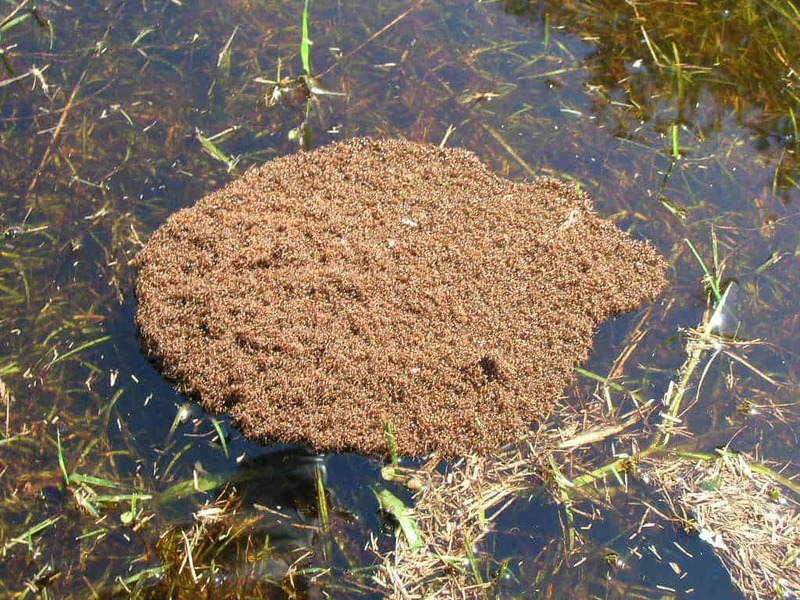 While this is an attested ability for a long time now, scientists have only recently managed to understand how the fire ants can assemble a raft made out of millions of insects in under 100 seconds and which can stand afloat for days, even weeks. This ability developed by the fire ants is an evolutionary developed byproduct so they can survive the intense downpour and floods in their native South America, but exactly how the process goes through is what interested scientists lead by Nathan Mlot, a doctoral student studying bio-inspired engineering at the Georgia Institute of Technology and lead author of the ant-raft report published in Monday’s Proceedings of the National Academies. The uneven, hairy surface of the ant’s skin explains this phenomenon, which works under the Cassie-Baxter law of wetting which states that as a surface gets rougher, water has a directly proportional rougher time in touching it. Another fine example is Duck feathers which also repel water because of their tiny bumps. Photo by Maggie, via Flickr. Researchers collected fire ants by roadsides in Atlanta and then filmed and froze the ants when they formed these floating clusters – once deposited into water in the lab, a spherical cluster of ants spread outward, like a drop of molasses. In less than two minutes the ants had linked “hands” to form a floating structure that kept all the insects safe. Even the ants down below can survive this way, thanks to tiny hairs on the ants’ bodies that trap a thin layer of air. “Even when they’re on the bottom of the raft, they never technically become submerged,” Mlot said. The resulting floating structure has a tremendous resistance and a very good water resistant property, since the Cassie-Baxter law which applies to a single individual is amplified when a massive group of ants all get linked together. Why can’t swarms of ducks combine and form similar rafts you may ask? Researchers say that the life saving ant rafts are made possibly primarily because of the millimetric constitution of the ants. And as is the case in the nature, every maker has its breaker, and for the floating fire ants this is soap. It and other surfactants — substances that break up surface tension of the water — wreak havoc with the rafts. “If you introduce just a small amount of soap to the surface of the water to lower surface tension then the raft will begin to immediately sink,” he said. The individual ants lose their plastron layer and can drown within seconds, he said.